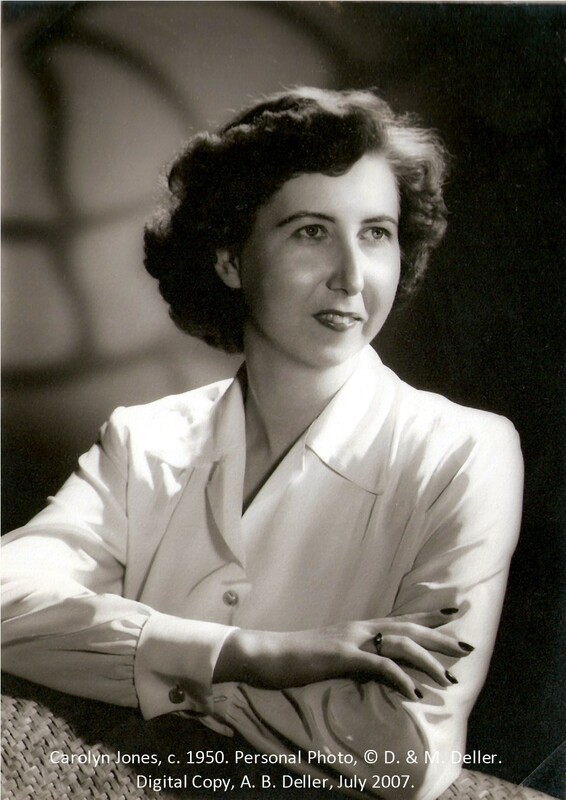 In 2014 I read about Amy Johnson's 52 Ancestors Challenge at Ancestry.com and at her blog site, started writing, finished a couple of blog posts, then got overwhelmed trying to write about an ancestor that I had a lot of information about. This challenge ended in early 2015, and now it's starting up again [see her latest post about it here]. I'm not following the prompts strictly, but I am trying to get a few more posts written. Arthur Jackson Jones was born on March 31st, 1897 in Little Rock, Arkansas to Arthur Clifton Jones and Georgia Jackson Jones. In the 6th grade of school he wrote an assignment entitled "Story of My Life. One of the first sentences was, "I was born at 814 Scott St in this city in the year 1897. I was the third son of my parents Mr. & Mrs. A.C. Jones." He was speaking of two older brothers, Edward Curtis Jones (1889-1960) and Dudley Emerson Jones Jr (1892-1971). He also wrote, " I have always gone with my mother when she has visited her mother. Sometimes we went by train to St. Louis and then changed cars and went on. And sometimes we went by boat from Memphis to St. Louis. One time when we went on the boat mama had my curls cut off." Entered from Kramer School, 1911. Hermesian Society; class football, '13. "I would rather be right than be president." "Enlargement of a photograph taken June 17 or 18, 1919 on the top of Eiffel Tower in Paris, France. Corporal Arthur J. Jones is shown in the photograph. Member of Motor Truck Company 497, Motor Supply Train 42. Was returning to Brest, France when was stationed from a two weeks leave spent in the British Isles. Picture was snapped by Lieut. Dudley E. Jones who was accompanied by Lieut. McDonald of La Grange, Illinois. The tower had just been opened again to the public following it's close during the World War. Looking to the east of the Trocaders. Enlargement made 4-18-29." Arthur was honorable discharged 11 October 1919 and returned to Little Rock. In January 1920 he was living with his parents in the same house at 816 Scott Street, along with his brothers and Curtis's wife, Jessie. 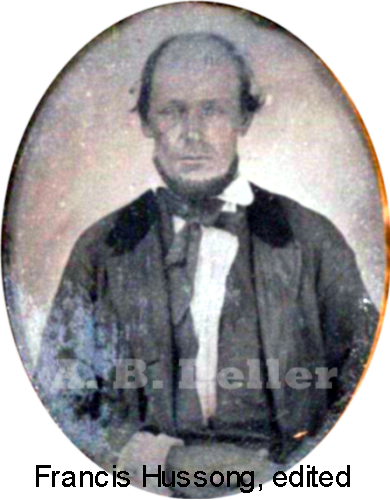 The census record states Arthur is 23 years old, born in Missouri (rather than Arkansas, as all the other census records state), and working as a lawyer. In that 6th grade assignment mentioned above, Arthur also wrote, "...I went to the St Louis University and studied to be a newspaper reporter." (Obviously this was not all based on current reality.) He went on to imagine a life in New York, and travel around the world as a news reporter interviewing Presidents and noted dignitaries. We have at least two records where he was working with a newspaper. "In the 1922 City Directory, Arthur lists his occupation as "Reporter Daily News," and in the 1925 "Reporter Little Rock Daily News" So even though he didn't make reporting his life's work, he did try it out. We're not sure when, or where, Arthur went to Law School. In an article about the William H. Bowen School of Little Rock, it mentions that the first law school was in Little Rock opening in the 1910s, but due to politics was made private and closed in the 1960s. The Encyclopedia of Arkansas website shares more. After the University of Arkansas in Fayetteville became the sponsor for the law program in Little Rock, there was a disagreement about the autonomy of the school, and the university withdrew that sponsorship. The school was privatized and renamed the Arkansas Law school, graduating it's last class in 1967. It was not accredited by the American Bar Association, but it's graduates could take the bar exam. And in the 1917 Little Rock City Directory, there is a listing, "Arkansas Law School - New Court House. Lectures every day during term 7:30 p.m. Dean, J H Carmichael [John H Carmichael]; Sec, T N Robertson." It's possible that when the school closed in 1967 that the records were destroyed, it's also possible that they were taken by the Little Rock Library or the University of Arkansas. That will require a bit more research. In any case, it was the closest law school, and unless he served as an apprentice with another lawyer, it's likely he attended there. We have 3 wallet cards that he carried from the Bar Association, for dues paid in 1961, 1962 and 1963, so I assume he sat and passed the Arkansas Bar Examination. His obituary stated that he was a graduate of the University of Arkansas Law School, but as we all know, sometimes the "facts" printed aren't entirely accurate. 1923 was a momentous year for Arthur. 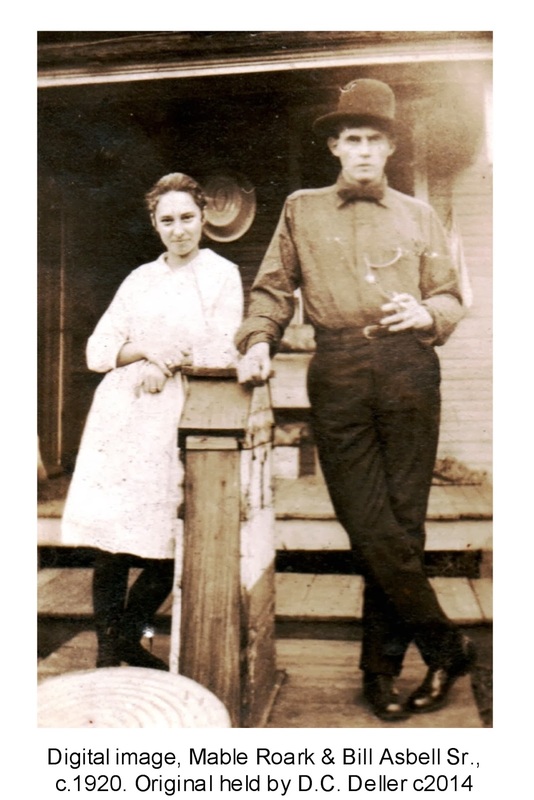 On January 24 he married Nell Marie Ingram in Miller County, Arkansas, on August 28 his father, Arthur Clifton Jones, died , and on October 5th, his first, and only child, Carolyn, was born. 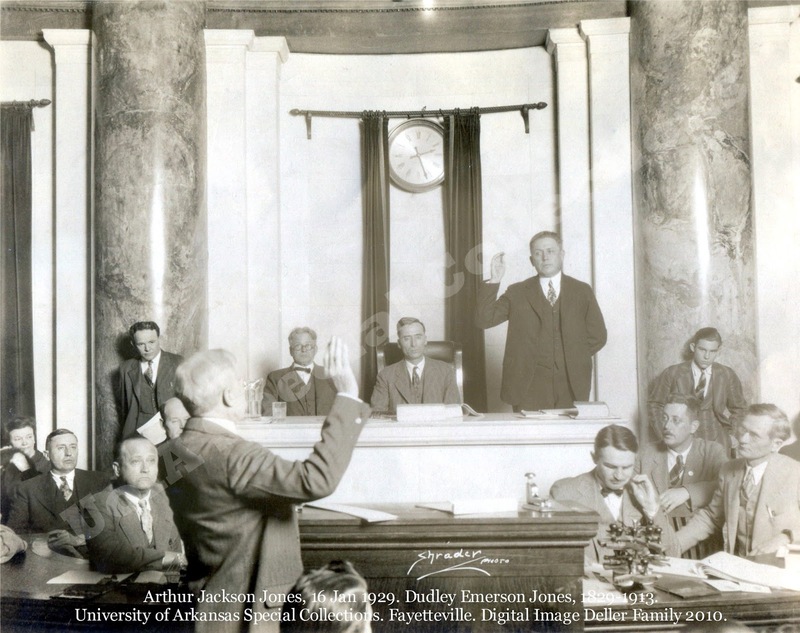 From 1927 to 1929 Arthur was a representative in the Arkansas State House of Representatives for Pulaski County. He was mentioned as a changed vote in the Arkansas Anti-evolution Bill of 1927 (House Bill No. 34). As a side note, this bill was tabled by the Arkansas Senate, and returned to the House without further consideration. Among the cards left in his wallet and desk was a political advertising card from a previous political campaign with a few items marked through and updated in pen, from 1952 to 1956, and House to Senate. His nephew, Norman, said that Arthur was always interested in politics, "He was always going down to the government buildings, he just enjoyed the whole political arena." Arkansas suffered greatly in the Flood of 1927, one of the worst disasters in U.S. history. To give you an idea of the magnitude, the Federal budget at that time was 3 Billion dollars, and the estimated cost of the flood and aftermath was 1 Billion - a third of that. According to the Encyclopedia of Arkansas, "not one dollar of federal money went in direct aid to the flood victims." While I can't find records, I can imagine that not only relief efforts, but other flood related issues must have been a part of the agenda before the Arkansas House in which Arthur would have been a member. Herbert Hoover, then Secretary of Commerce said that the government would give what aid it could but the burden would rest upon the Red Cross. Their efforts were partially documented in this article at the Red Cross website. At the very least, it would have been in the news most days and discussed among family and friends. With 36 out of 75 counties affected by the flood, I can imagine most people were themselves, or knew someone who was, directly affected by the flood. In Arthur's case, both of his brothers and their families were living in Memphis, Tennessee at the time; though we don't know how or if they were personally affected. 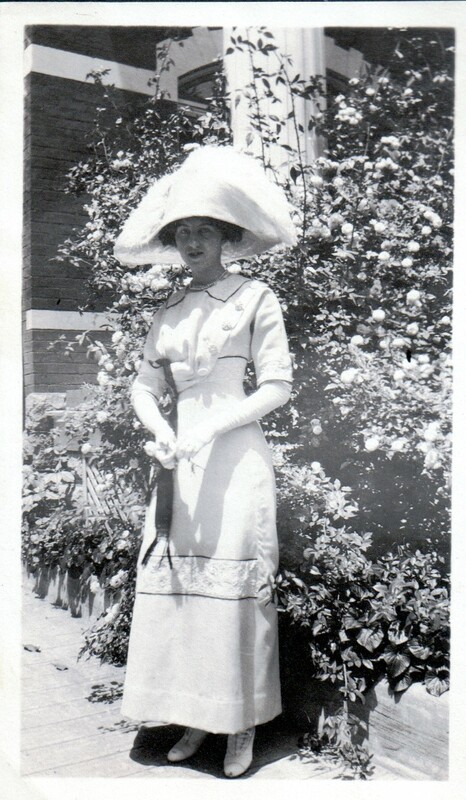 In December 1928 his mother, Georgia Jackson Jones, died from influenza in Memphis, Tennessee while visiting her two sons who lived there. Up until this time, Arthur, Nell and Carolyn had been living with her at the home on 814 Scott Street. 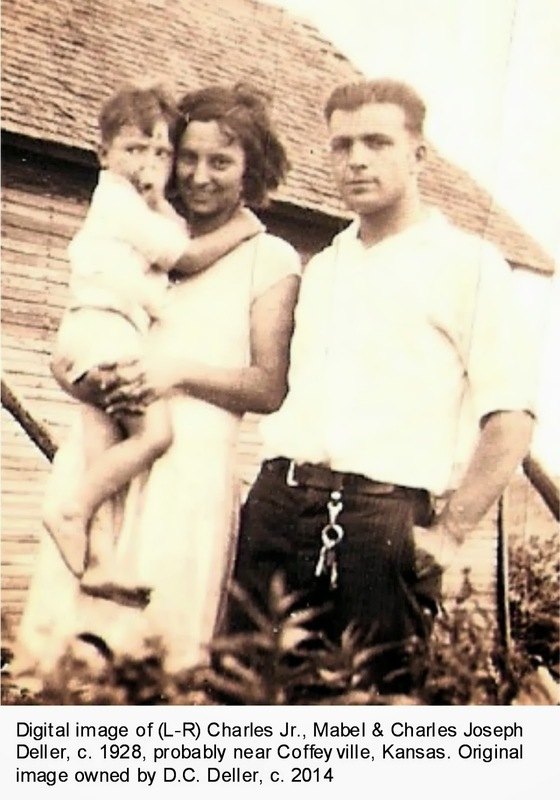 Nell's nephew, Norman Snodgrass, remembered his family living with Arthur, Nell and Carolyn around 1929 or 1930, when they were in-between residences. 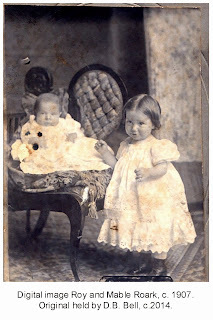 That was Elizabeth (Nell's sister) and Edward, and the children, Betty Lou, Marjorie and Norman, then Arthur, Nell and Carolyn, and Nell and Elizabeth's mother, Viola. That's 9 people, a really full house. By the 1930 census the house had been divided into two halves and one side was rented out for income; I hope that happened after Norman's visit. In the 1930 census record, Arthur was living with his wife and daughter, his mother-in-law, Viola Taylor Ingram, and an African American servant Carrie Curtis, and they owned a radio. He was working as a lawyer in his own office and it was noted that he was a veteran of the World War. David remembers his mother (Carolyn) saying that she remembered a grandmother who was sickly. It's only a guess, but it may be that the servant lived with them to help take care of Viola. In a general Google search one day, I came across a letter Arthur had written to President Franklin Roosevelt dated 24 March 1936. He included a cover letter to the president's secretary requesting her assistance in setting it before the President, and in the letter recommended that the credit laws be loosened to help bring an end to the Depression. The copy includes both Arthur's letter, and President Roosevelt's initial response (asking Governor Eccles of the Federal Reserve Board to send him a memo he could send back to "Mr Jones"). If there was a further reply to Arthur, it's not shown with these documents, nor is there a letter in the family's possession. The only reason this file was at the Federal Reserve website, was because the President asked the current chairman for a reply to presumably send with his response to Arthur. It's possible that correspondence between President Roosevelt and citizens of the United States are available at his Presidential Library. The FDR library website says that the President received approximately 3000 letters per day while he was at the White House. The fact that a copy of Arthur's letter survives is a bit of a miracle. The 1940 Census lists Arthur, Nell and Carolyn living at 814 Scott Street. 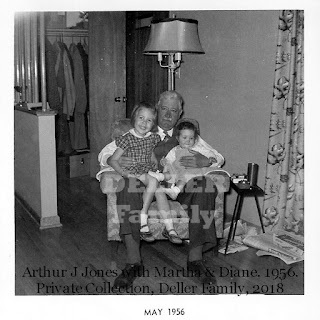 The record shows that Arthur was 43 years old, had completed 2 years of college, been born in Arkansas and lived in the same place in 1935, that he was the Chief Clerk in Records and Research, at a Government facility, and received a salary of $877. In 1942 he and Nell were listed in the Arkansas City Directory, he was listed as working as a Clerk. He also registered for the World War II Draft as required by law. All of information on this was consistent with what has been seen in previous documents, i.e. name, address, age and birth date, name and address of his wife, Nell, (as emergency contact). It does mention a telephone number (7490) and lists his Employer as Quarter Masters Office, Camp Robinson, Little Rock. On the back, the Description of Registrant is: White, 5 ft 11 3/4 in., hazel eyes, 220 lbs, brown hair and light complexion. Date of registration February 16, 1942. There are more entries in Little Rock City Directories; the ones we have copies of include 1944, 1952 and 1956. In them he is listed as a Lawyer. There are more City Directory listings, but no other public records available that we have found. There were visits from Carolyn and her family to visit with her parents, and must have been at least one visit when Arthur went with Nell to visited Carolyn and her family at their home. 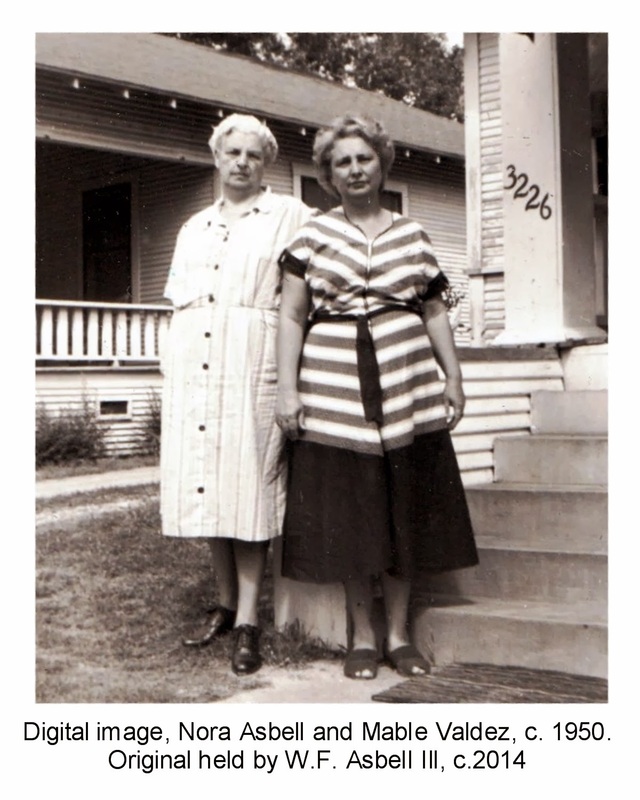 The Photo to the right was taken in Little Rock, in front of the Scott Street house in 1952 and the photo below taken with the two girls was at Charles & Carolyn's home in Owasso, Oklahoma. Arthur died on 30 September 1963 of acute peritonitis in the VA Hospital in Little Rock. He was buried on 2 October 1963 at Roselawn Memorial Park in Little Rock. The Cage 1914 - Little Rock High School Annual. 1914. Privately held by David C. Deller, [Address for private use], New Bern, North Carolina. 2014. Arthur J. Jones, Little Rock, Pulaski death certificate 013920 (30 September 1963). "U.S. WWII Draft Cards Young Men, 1940-1947," Ancestry.com Operations Inc., , Arthur Jackson Jones. Certificate to Arthur J. Jones from State of Arkansas Adjutant General's Dept, 9 October 1952. Jones, Arthur Jackson. "Story Of My Life." School paper. about 1908. Dudley Emerson Jones, 1829-1913. University of Arkansas Special Collections. Fayetteville, Arkansas. Ancestry.com, 1900 United States Federal Census, Year: 1900; Census Place: Little Rock Ward 2, Pulaski, Arkansas; Roll: T623_73; Page: 3A; Enumeration District: 74. Ancestry.com, 1910 United States Federal Census, Year: 1910; Census Place: Little Rock Ward 2, Pulaski, Arkansas; Roll: T624_62; Page: 2A; Enumeration District: 110; Image: 681. Ancestry.com, 1920 United States Federal Census, Year: 1920; Census Place: Little Rock Ward 2, Pulaski, Arkansas; Roll: T625_79; Page: 2A; Enumeration District: 121; Image: 53. Ancestry.com, 1930 United States Federal Census, Year: 1930; Census Place: Little Rock, Pulaski, Arkansas; Roll: 91; Page: 25A; Enumeration District: 16; Image: 430.0. Ancestry.com, 1940 United States Federal Census, Year: 1940; Census Place: Little Rock, Pulaski, Arkansas, ED 60-22, 61A, , Arthur J Jones. 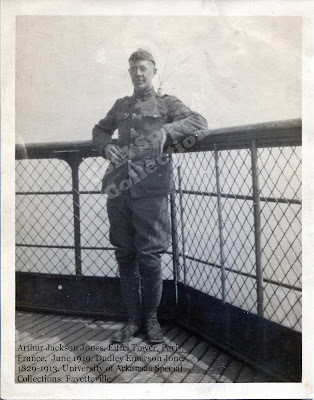 Arthur Jackson Jones, Paris, France, 1919, Item 22, Dudley Emerson Jones, 1829-1913. University of Arkansas Special Collections. Fayetteville, Arkansas. U.S. City Directories, 1822-1995, Ancestry.com Operations Inc., 2011. Digital images. Little Rock, Arkansas, City Directory, 1922; Arthur J Jones. U.S. City Directories, 1822-1995. Ancestry.com Operations Inc., 2011. Digital images. Little Rock, Arkansas, City Directory, 1925; Arthur J Jones (Nell). Catalogue of the Arkansas Law School, Little Rock Arkansas. 1901-1902. University of Arkansas, Central Printing, 1901. U.S. City Directories, 1822-1995, Ancestry.com Operations Inc., 2011. Digital images. Little Rock, Arkansas, City Directory, 1917; Arkansas Law School. Bar of Arkansas Membership Cards. 1961/2. Privately held by D. C. Deller, [Address for private use], New Bern, North Carolina. 2018. "A. J. Jones Dies; Retired Attorney," page 9B, column 2. "Arkansas County Marriages, 1837-1957." Index and images. Family Search.org. FamilySearch.org. familysearch.org : 2010. 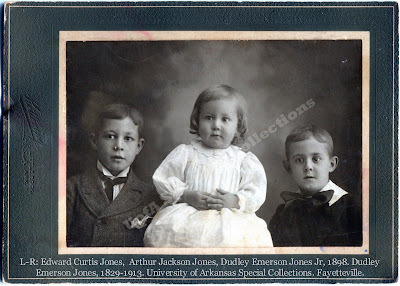 Ancestry.com, Arkansas Death Index, 1914-1950, Arthur C Jones. Oakland Cemetery (Little Rock, Arkansas), book, Arthur C. Jones. Burial Entry Page 2624. Carolyn Jones, birth certificate no. 2173 (1923), Arkansas State Board of Health, Little Rock, Arkansas. Parry, Janine A. Richard P. Wang, David Pryor. Readings in Arkansas Politics and Government. Fayetteville, Arkansas: University of Arkansas Press, 2009. Priest, Sharon Secretary of State. Historical Report of the Arkansas Secretary of State. Little Rock, Arkansas: State of Arkansas, 1998. "Arkansas, 1927-HB34", National Center for Science Education, website .Accessed 12 Jan 2018. Arthur J Jones Political Campaign Card, 1952. Privately held by D. C. Deller, [Address for private use], New Bern, North Carolina. 2018. E. Norman Snodgrass visit, January 2008. "'The Red Cross is Not All Right!' Herbert Hoover's Concentration Camp Cover-Up in the 1927 Mississippi Flood", Myles McMurchy, Written for "Race, Ethnicity, and the Immigration in U.S. History" Professor Annelise Orleck, Dartmouth College 2016. Accessed 12 Jan 2018. Shelby County, Shelby County Register of Deeds, Digital Image at register.shelby.tn.us, 1927 Polk City Directory, Memphis, TN, Pg 726, Curtis E (Jessie) Jones, and Dudley E (Leona M) Jones, accessed 22 Jan 2013. Shelby County, TN - Shelby County Register of Deeds, Death Certificate - File # 3910 - Georgia Jackson Jones. U.S. City Directories, 1822-1995, Ancestry.com Operations Inc., 2011. Digital images. Little Rock, Arkansas, City Directory, 1928; Arthur J Jones (Nell I). The Federal Reserve Archival System for Economic Research, FRASER, Federal Reserve Archive, Correspondence regarding Arthur J. Jones. U.S. City Directories, 1822-1995, Ancestry.com Operations Inc., 2011. Digital images. Little Rock, Arkansas, City Directory, 1942; Arthur J Jones. Our connection to the Hussong family is from Elnora Hussong [1888-1965], to her father, George W. Hussong [1854-1929], to his father, Andrew B. Hussong [1822-1882]. I haven't found a source for Andrew's parents, but the family has these photos, with a note saying they are Francis and Elizabeth Hussong, no other information. A cousin holds these two photos. 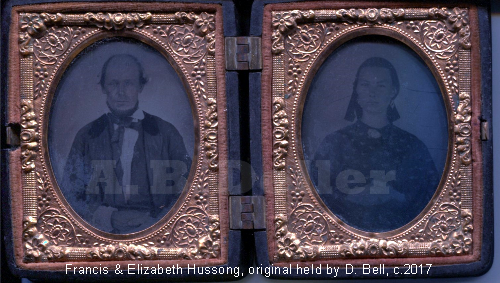 I haven't seen them in probably 4 years or more, and can't remember exactly, but they appear to be daguerreotypes, you can see examples here. I've done some [very basic] editing to the photos - to try and make them clearer, since the scan was done with them in the cases. If you happen to see these, and recognize them from other photos you've seen, I'd love to hear from you! © D & M Deller. Digital copy A.B. Deller, 23 Oct 2012. Wordless Wednesday - Happy Birthday Carolyn! There's not much to show here for 7 years worth of blog, but there's been lots going on in the background. On October 1st I began receiving an email from Amy Johnson Crow with a tip each day entitled, "31 Days to Better Genealogy." If you're interested, as I am, she does have good information to share, and I'd encourage you to participate. Personally I'm hoping it'll supply a well needed boost of energy to get this site up and active again. It's a lot of pressure to put on one person, so I won't tell her. I'll just hope and pray for the best! I'll jump back into the blogging world with this simple photo of Charles & Carolyn Deller and their family, taken in Owasso, Oklahoma, probably before 1961. 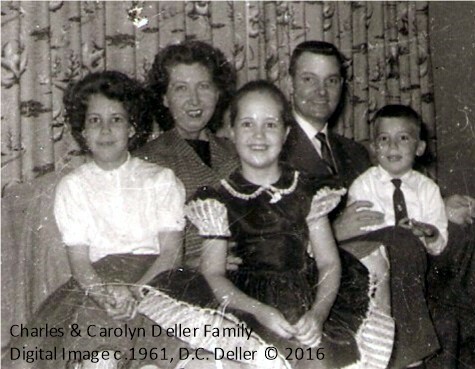 The first place I associated with the Deller family was Coffeyville, Kansas. We didn't have a lot of information, but what we did know was that Charles Joseph Deller had grown up there. As I searched online, I found that Coffeyville was located in the southeast corner of Kansas, in Montgomery County. It was established in 1869, originally as an Indian Trading post by Col. James A. Coffey. In 1871 the railroad came through and the city was laid out and incorporated in 1873. In October 1892, in what might be the cities most famous incident, the Dalton gang tried to rob two banks at one time. The plan didn't work, and four of the gang were killed, with only Emmett Dalton surviving (with 23 bullet wounds). Four citizens of Coffeyville, including a U.S. Marshall were killed in defending the city. There is a Dalton Museum now, and every October they celebrate "Dalton Defender Days", a remembrance of those who lost their lives defending the city. Coffeyville had many natural resources, including natural gas, and by the early 1900's there were ten glass factories in operation as well as brick companies. These prospects for jobs were probably what brought Peter Deller and his family (including Charles Joseph) to Coffeyville from McKean County, Pennsylvania. 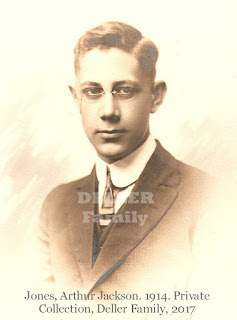 His brother, Nickolas "Nick" Deller was already there by 1910. They attended the local Catholic church, and may have even helped in it's building, since it wasn't completed until 1916. Peter and his family initially rented a house on Delaware Street, but by 1930 owned that same house. Coffeyville was a good place for the Deller family. Both Peter and Carrie raised their children and lived out the rest of their lives there. Coffeyville, Kansas, Wikipedia, [http://en.wikipedia.org/wiki/Coffeyville,_Kansas], accessed 23 Feb 2011. Coffeyville History, Coffeyville Kansas website, [http://www.coffeyville.com/History.htm], accessed 23 Feb 2011. Dalton Defenders, Coffeyville Chamber of Commerce website,[http://www.coffeyvillechamber.org/Dalton-Defenders-35840.asp], accessed 23 Feb 2011. Brick and Glass, Coffeyville Chamber of Commerce website, [http://www.coffeyvillechamber.org/Brick-and-Glass-35900.asp], accessed 23 Feb 2011. FamilySearch.org, 1910 United States Federal Census, Year: 1910; Census Place: Coffeyville Ward 2, Montgomery, Kansas; family 1, page 1. Accessed 23 Feb 2011. History, Holy Name Catholic Church website, [http://www.holynamecoffeyville.org/History.html]. Accessed 23 Feb 2011. Ancestry.com, 1920 United States Federal Census, Year: 1920; Census Place: Coffeyville Ward 5, Montgomery, Kansas; Roll: T625_541; Page: 16A; Enumeration District: 180; Image: 1088. Ancestry.com, 1930 United States Federal Census, Year: 1930; Census Place: Coffeyville, Montgomery, Kansas; Roll: 712; Page: 8B; Enumeration District: 22; Image: 546.0. I read about Amy Johnson's 52 Ancestors Challenge at Ancestry.com and at her blog site. She said, "My goals with No Story Too Small have been to remind myself that it's alright to blog about just a portion of someone's life..." I have been trying to start writing a family history, but I've gotten easily overwhelmed and discouraged wondering when and where to start. So, while the research will never really be complete, this has encouraged me to start writing about what we have found. On 27 February 1914, Mable's father, George Thomas Roark died from Pulmonary Tuberculosis attributed to working in the mines. It was probably difficult for a young widow with two young children, but Mable's mother was a hard working woman; we know that later in life she took in laundry and grew a garden to make ends meet. Her family and Tunny and other members of the Roark family may have helped her as well. There was also a suggestion that the mining companies paid some type of benefit to the deceased miner's family, and if that was the case, I'm sure it would have been very welcome. 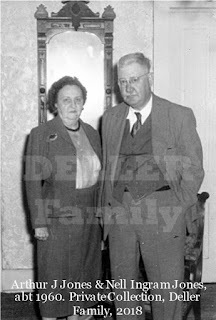 Four years later, on 8 March 1918, Mable's mother, Elnora, married William "Bill" Franklin Asbell in Joplin, Missouri. They continued living in the Joplin area, at least until 9 February 1919, when Mable's little brother, Roy, died from pneumonia. He was buried next to his father in an unmarked grave at Fairview Cemetery in Joplin. 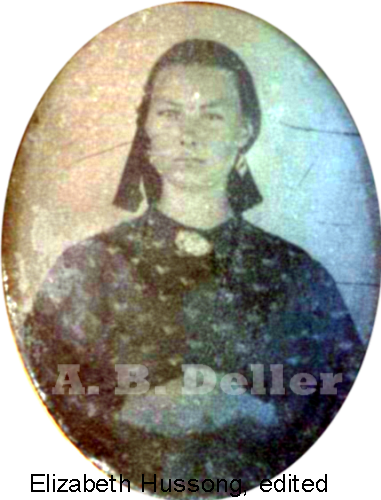 By January 1920, Mable was 13 years old and the new Asbell family was living in Coffeyville, Kansas, on Dakota Street; just one street away from the Deller family. In June she welcomed a little brother, William Franklin Asbell, Jr. Then four years later, on 16 February 1924, right after she'd turned 18, she married Charles Joseph Deller. In 1924, Nora and Bill Asbell, along with some others, made a trip to California. It is thought that they went in search of jobs. They camped out along the way and took various photos. 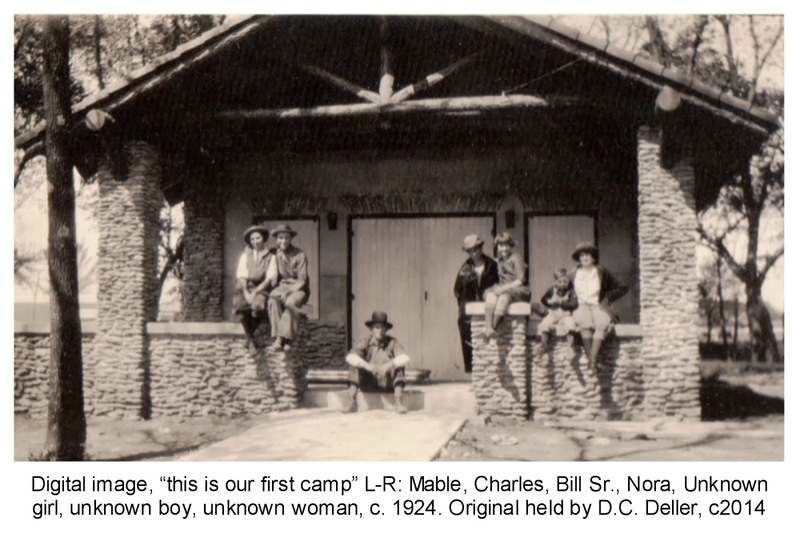 There is one that seems to show Charles and Mable on the first night they made camp. We don't have any hard evidence for this trip, other than family stories and a few photos, but it certainly brings history a little closer to home. 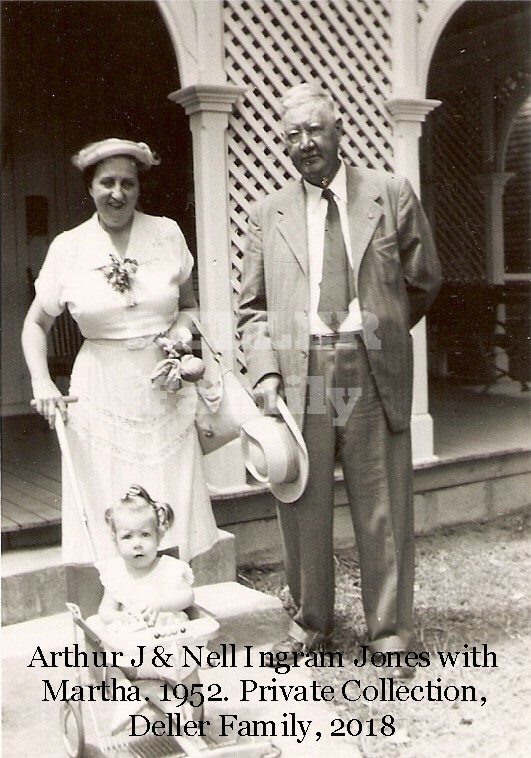 In January of 1925, the young family was living in Picher, Oklahoma, and Mable had her first child, Charles Joseph Deller Jr. Mable had, what was then called, a nervous breakdown after little Charles was born, and her mother, Nora, took care of her and the baby at home. By 1930 Charles, Mable and little Charles were living in a rented house on Maple Street in Coffeyville, Kansas. This happened during the Depression. Their oldest daughter remembers, "...there were no jobs, they moved in with his family for awhile. 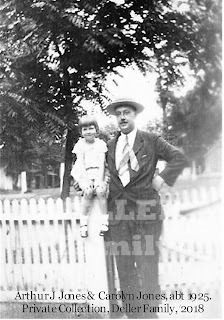 One of the stories goes that Dad would get up early, in time for the milk man to deliver other peoples milk and he would go up to the porches and steal the milk so I would have milk to drink. Another story was he would have a cup of coffee for breakfast, then walk approximately 10 miles , work all day for the WPA and then walk back home. I think their supper was a bowl of beans. They had a very hard time of it, I think that is why Charles [Mable's son] lived with his grandmother, as she had pigs, chickens and a vegetable garden, so they always had plenty of food. In November 1933, Mable and Rudy had their first little girl and in March of 1935, they had a second daughter. In 1939 young Charles had moved to live with his mother and step-father in Dallas, when he received a letter from his father. Four days later, Charles Joseph Deller, Mable's first husband, died from an accidental drowning. Their son attended the funeral with his grandmother Nora. Mable, Rudy and the two girls traveled all over the south, as Rudy worked different construction jobs. I've not been able to find the family in the U.S. 1940 Federal Census, probably because of this. Their oldest daughter shared, "[We] were always the new kids in class. One year we attended seven different grade schools. It was terribly hard to keep good grades. Mother was a good trouper, she never complained about all the traveling but when I was starting high school, she put her foot down and said the gypsy days were over. They bought a duplex in Dallas and settled down. If he [Rudy] had work out of town, he went alone." This would probably have been after World War II, between 1947 and 1949, when their oldest daughter was about 15 years old. On 2 December 1950, Mable attended the wedding of her son Charles, to Carolyn Jones in San Antonio, Texas, and in 1953 and 1955 she attended the weddings of her daughters. 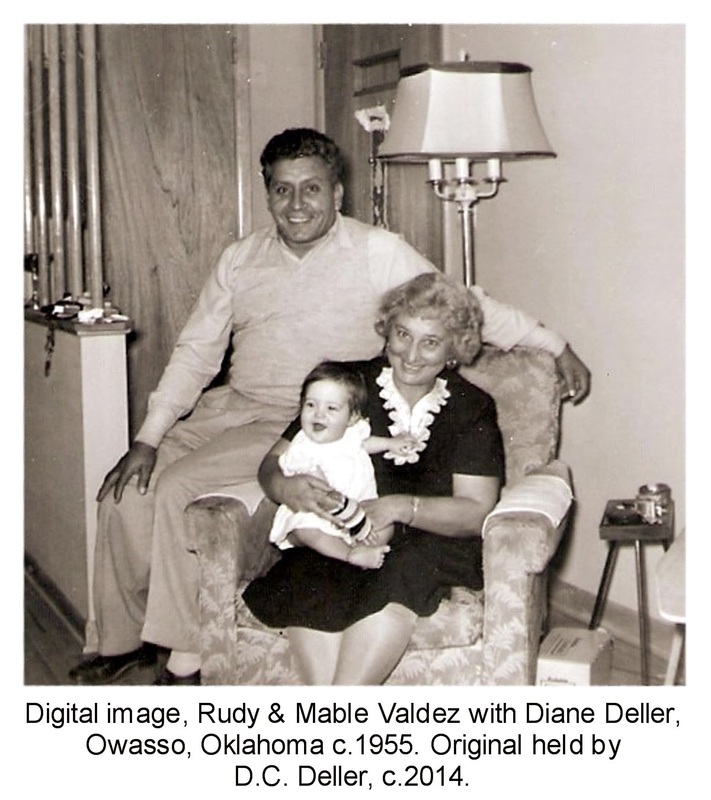 During the 50's and 60's, family photos show that Mable and Rudy visited her son Charles and his family in Owasso and Tulsa, Oklahoma, her daughters and family and also her mother Nora, who was then living with her son Bill Asbell Jr.
 ROARK, F, first child, Cherokee County Birth Records 1903-1911 birth certificate (1906). Ancestry.com, 1910 United States Federal Census, Year: 1910; Census Place: Webb Ward 2, Jasper, Missouri; Roll: T624_791; Page: 14B; Enumeration District: 61; Image: 852. "Mining Artifacts & History." Article. Mining Artifacts. http://www.miningartifacts.org : 2014. George T Roark, death certificate no. Registration District No. 411, File No. 5118, Primary Reg Dist No 2002, Registered No. 75 (1914), Missouri State Board of Health Bureau of Vital Statistics Certificate of Death, St Louis, MO. Marriage Certificate for William F Asbell & Norah Roark. Ancestry.com, Missouri Death Records, 1834-1931, Death Certificate - Roy Roark. Ancestry.com, 1920 United States Federal Census, Year: 1920; Census Place: Coffeyville Ward 5, Montgomery, Kansas; Roll: T625_541; Page: 14B; Enumeration District: 180; Image: 1085. Ancestry.com, Social Security Death Index, Number: 446-10-1910; Issue State: Oklahoma; Issue Date: Before 1951. Montgomery Kansas, Marriage License, 11464, 16 February 1924. Charles J. Deller Jr., birth certificate no. Reg. Dist. 58254, Primary Dist No. 8315, Reg. No. 89 (1925), Oklahoma State Board of Health, Bureau of Vital Statistics, Oklahoma City, Okla.
 E.D. Valdez, "nora=mable=deller," email to A.B. Deller, 3 May 2013. Ancestry.com, 1930 United States Federal Census, Year: 1930; Census Place: Coffeyville, Montgomery, Kansas; Roll: 712; Page: 12A; Enumeration District: 22; Image: 553.0. Society, Oklahoma Historical. "Marriage Records." Database. Research Center. www.okhistory.org/research: 2014. E.D. Valdez, "Mable-Deller ltr," email to A.B. Deller, 17 October 2009. 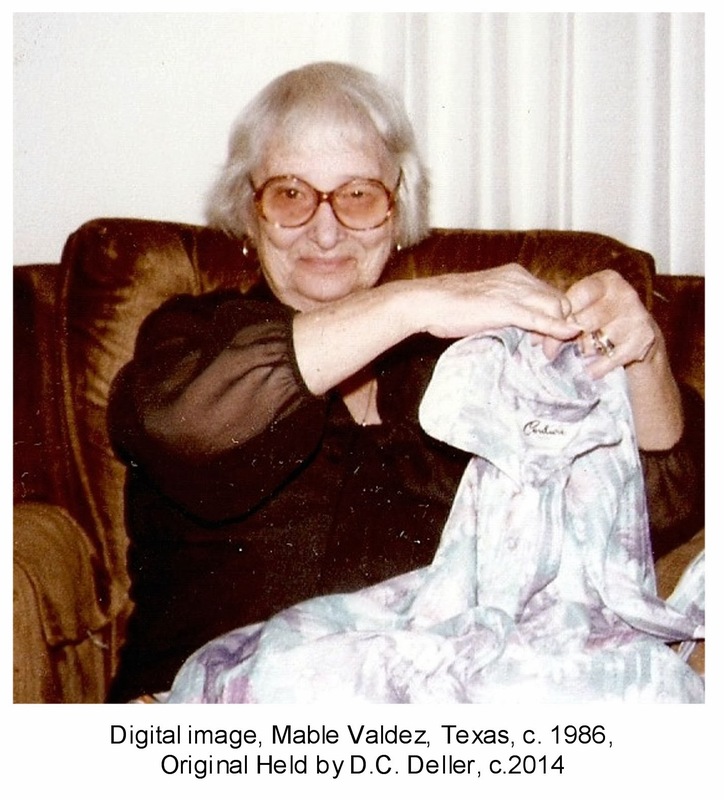 Valdez, "Mable-Deller ltr," email to A.B. Deller, 17 October 2009. Personal knowledge of the author, E. D. Valdez. Letter from Charles Joseph Deller to Charles Franklin Deller, 11 Jul 1939. Charles J. Deller, notice, unidentified clipping, Newspaper Clipping - Funeral Service for Charles Joseph Deller. Charles F. Deller and Carolyn Jones Wedding, Reception, digital image. 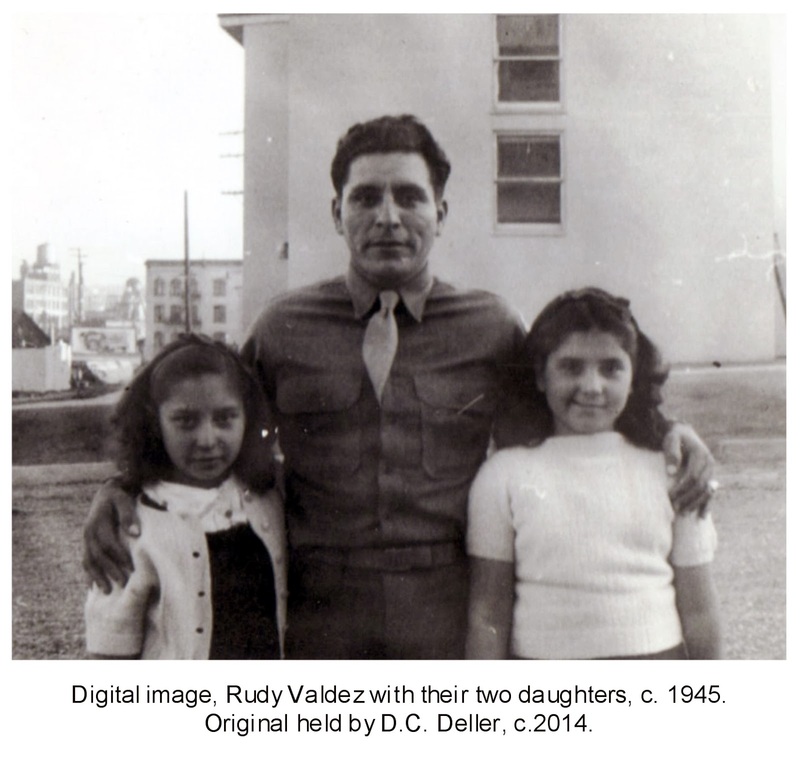 Multiple photos of Mable & Rudy Valdez with Deller and childrens families, digital images. Nora Asbell, Dallas, Dallas Texas death certificate 14242 (1965). Ancestry.com, Social Security Death Index, Number: 457-16-6260; Issue State: Texas; Issue Date: Before 1951. Gravestone for Mable A. Valdez, 1909 - 1988, Laural Land Cemetery, Dallas, Texas. E.D. Valdez, telephone interview, 16 April 2010. D.C. Deller, interview, 14 January 2014. 10 February - Happy Birthday Granny Mable! Labels: Coffeyville, Dallas, Elnora Hussong, Elnora Nora Hussong, Galena, George T. Roark, Joplin, Mable Allie Roark, Mable Roark, Mable Valdez, Roy Roark, Rudy Valdez, Tunny Roark, William F. Asbell, William F. Asbell Jr. I'm interested in learning more about our family history; focusing on those from Arkansas, Germany, Illinois, Indiana, Kansas, Missouri, New York, North Carolina, Pennsylvania, and the United Kingdom.